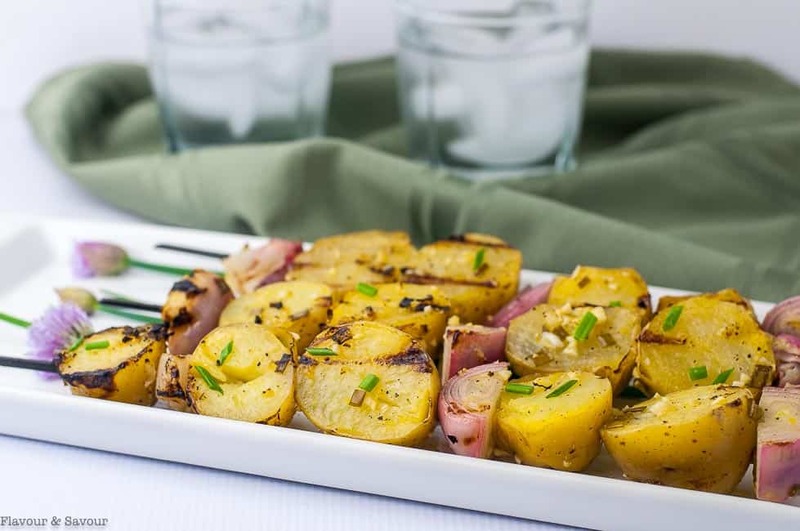 Lemon Garlic Potato Kabobs, hot off the grill, round out a casual dinner at any time of year. 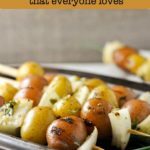 These tiny Lemon Garlic Potato Kabobs are quick to prepare and oh-so-delicious! 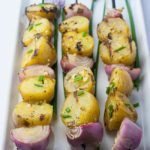 Baby potatoes, skewered with shallots and bathed in a lemon-garlic marinade–these crispy grilled potatoes are always popular in our home. Grilling adds flavour and makes them crispy on the outside, but tender inside. 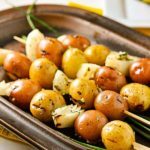 They remind me of these Crispy Lemon Oven-Roasted Potatoes (that we LOVE) but these are smoky from the grill, too. Grilling used to be something we only did in the summer months, but now we grill year-round. If the weather is very cold, I’ll use my stove-top grill pan, but most of the time I love to hang out by the barbecue on the deck and baby my dinner as it’s cooking. 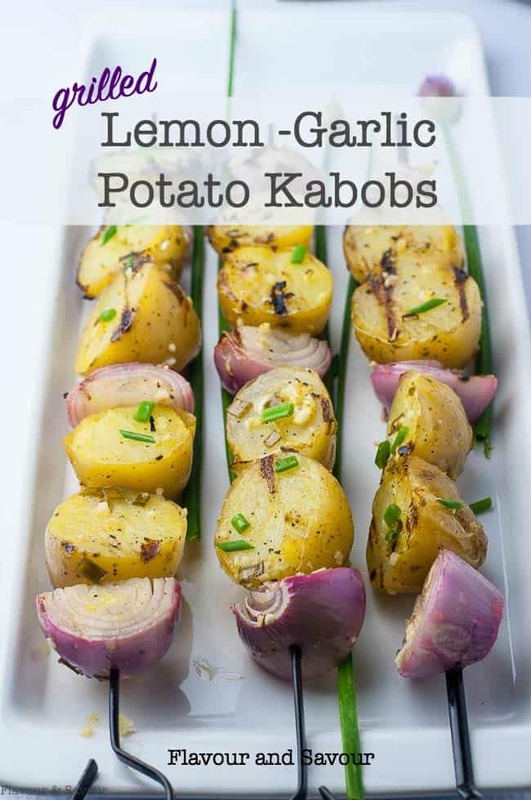 These lemon garlic potato kabobs take only a few minutes to get that crispy grilled texture and smoky flavour, because you cook them on the stove or in the microwave first before tossing them in the lemon-garlic marinade and threading on skewers. Add different herbs, like rosemary, thyme or oregano to change the flavour when you make these another time (because I guarantee you will)! Make these Lemon Garlic Potato Kabobs at any time of year! 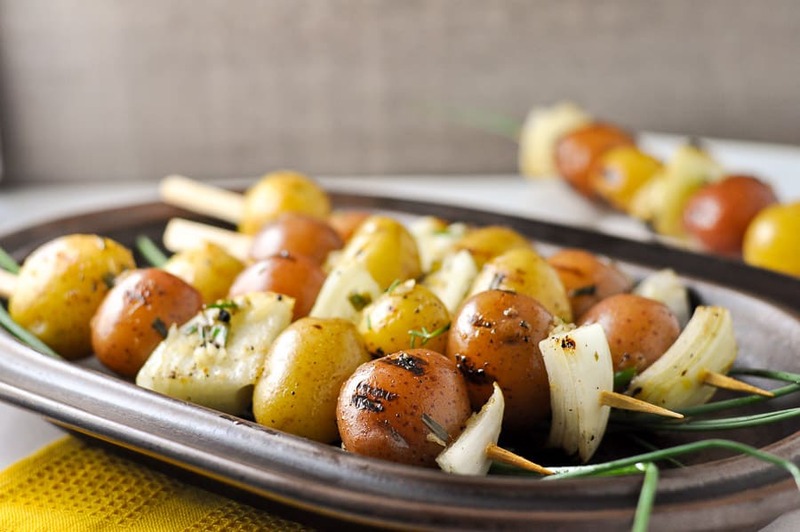 Cook potatoes until tender, toss in a marinade made with lemon, garlic and chives, thread on to skewers alternatively with shallots (or onions) and grill until skins are crispy. Scrub potatoes and boil or microwave until just tender (and can be pierced with a fork). Drain. In a large bowl, place the oil and lemon juice. Grate the lemon zest, squeeze the lemon, minced the garlic, snip the chives and whisk together with the salt and pepper. 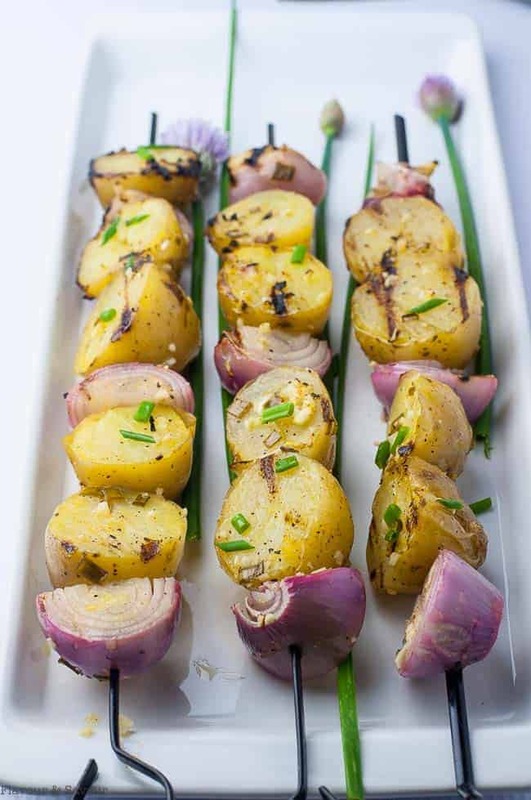 Gently toss the potatoes and shallots with the lemon-herb mixture to coat. 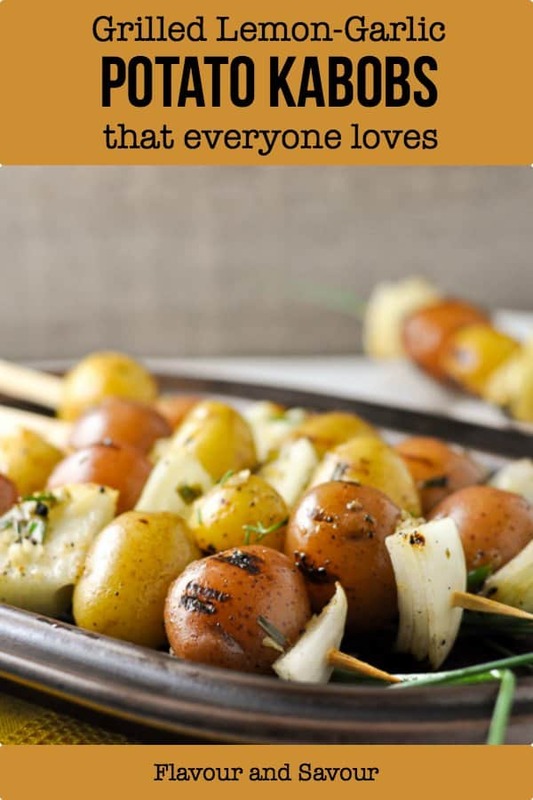 Thread the potatoes and shallots alternatively on skewers. Grill over medium heat, turning and reserving with the remaining marinade until crispy, 8 - 10 minutes. Sprinkle with a little coarse sea salt (or smoked sea salt) and serve.